If you're looking for a new feline friend, you should definitely consider a rescue cat. Cats Protection has thousands of cats and kittens waiting for loving homes and when you adopt from us you can be sure they are happy and healthy. If you're still not convinced that adopting it better then buying when it comes to getting a new pet, take a look at the finalists of the National Cat Awards Outstanding Rescue Cat Awards. The winner of the award will be chosen by a panel of celebrity judges and announced at a star-studded ceremony at London’s Savoy Hotel on Thursday 2 August. One fabulous feline will also be crowned National Cat of The Year! A very unusual moggy has arrived at Cats Protection’s brand new Tyneside Adoption Centre in the north east. 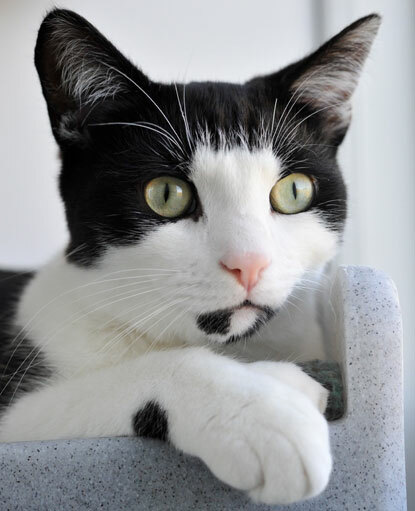 Wilbur is a polydactyl cat, meaning he has an additional digit on each of his paws. Instead of the normal 18 toes, this adorable black-and-white puss has a total of 22! 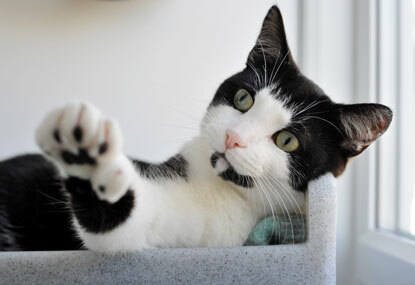 Although not common, polydactyl cats can be found across the UK. It is a genetic condition that, in the majority of cases, causes no harm to the cat whatsoever. Some polydactyl cats have just one extra toe on each paw but some can have two or even three extra on each foot. If a polydactyl cat has kittens, there is a good chance some of her kittens will also have the condition. 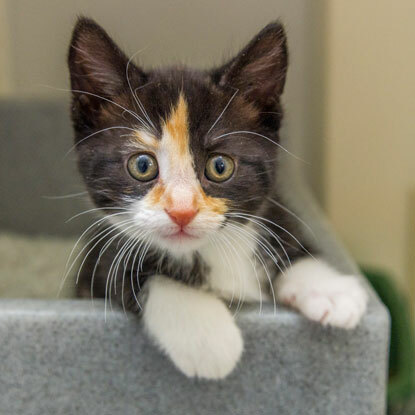 Cats Protection’s Tyneside Adoption Centre in Gateshead will be officially opening its doors on 14 July but due to demand it is already full of cats and kittens looking for their forever homes. Members of the public are invited to join staff and volunteers at the official opening from 12pm on Saturday 14 July. There will be tours of the centre, giving people the opportunity to meet some of the feline residents, and refreshments will be available including some feline-themed cakes to enjoy. If you can offer Wilbur, or any of the other cats at the centre, a loving new home then please call the Tyneside Adoption Centre on 0191 653 1052. As they are strict carnivores, cats should eat a meat-based diet, but that doesn’t mean they can live off of your leftover chicken. In addition to lots of protein, they also need the right balance of vitamins and minerals to keep them happy and healthy. To ensure your moggy gets all the nutrients they need, it’s best to feed them a commercially complete cat food that will have been specially-formulated to meet their dietary requirements. Your local pet store or supermarket will have lots of varieties to choose from, just make sure it says it’s a ‘complete’ cat food on the label. dry food can be good for oral health as chewing on the kibble can help clean your cat’s teeth. It’s also ideal for putting in puzzle feeders that will encourage your cat to exercise while they eat and keep them from getting bored. Cats have evolved to eat little and often so ideally their daily food ration should be divided into at least five portions and fed to them throughout the day. To find out how much to give them, follow the advice on the food packet, but monitor their weight closely and speak to your vet if you notice either an increase or decrease in body weight and condition. It’s okay to give your moggy the occasional tasty treat. There are lots of cat food treats available, or you could give them a piece of well-cooked chicken or fish. You could even have a go at making your own cat treats. However, it’s important to remember that these will not contain all of the nutrients your cat needs, so should only be given alongside a complete cat food. 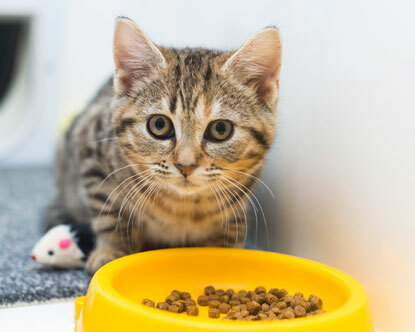 Too many treats can also lead to weight-gain, so when treating your cat it’s best to set aside a small portion of their regular food so that you are not adding calories to their daily ration. Although cats feed on their mother’s milk as kittens, when they’re weaned they lose the ability to digest it properly and become lactose-intolerant. Therefore, eating dairy products such a milk and cheese is likely to give them an upset stomach. Cat milk also contains a lot of calories, so could cause your puss to pile on the pounds. It may be a tasty treat for us, but chocolate is lethal for cats. It contains a substance called theobromine which is toxic for both dogs and cats and even in small amounts can cause heart problems, seizures and even death. While most cats would happily eat a raw food diet, it can pose many problems. Firstly, raw meat contains bacteria and parasites that could make the cat, and the owner preparing the food, ill. Secondly, many raw food diets do not contain sufficient nutrients to keep your cat healthy. A common cat myth is that feeding them garlic will help get rid of parasites such as fleas and worms. In fact, garlic and onions are very harmful to cats and even small amounts can lead them to develop life-threatening anaemia. You’re much better off dealing with parasites using treatments prescribed by your vet. Liver is high in vitamin A and can make your cat seriously ill if they eat it too frequently. If you do give your cat liver, make sure they do not have it more than once a week. Tuna that is specially-formulated as a cat food is fine to feed your moggy, but tuna meant for human consumption is best avoided as it can cause digestive upsets. Dogs and cats have very different dietary needs, as dogs are omnivores while cats are carnivores. Therefore, dog food will not contain enough meat-based protein or the right vitamins and minerals to keep your cat healthy and so should not be given as a substitute for cat food. The only thing your cat needs to quench their thirst is water and it’s important that they have access to a fresh, clean supply at all times. You can find more tips on keeping your moggy hydrated here. If you have any concerns about your cat’s health or diet, speak to your vet for tailored advice. You can also find lots more general cat diet advice on the Cats Protection website. The first thing you should consider is whether you and your moggy are healthy, as diseases can be passed between you through kissing. If either of you is ill, then this type of close contact should definitely be avoided! Another thing to make sure of is that your cat is used to this level of contact from you. If you’ve never given them a kiss before, they might not take kindly to the sudden invasion of personal space. When going in for a kiss, the most important thing is to avoid kissing on the lips, for hygiene reasons. It’s best to avoid the stomach too as most cats don’t like having their tummy touched. Cats usually prefer brief interactions so if you do want a kiss, a quick peck is best. This ideal way to show your cat some affection though, is to let them come to you. Cats greet each other with nose-to-nose touching, so try presenting your face to them to see if they come forward for a sniff. Not as such. Cats are descended from the African wildcat, a solitary hunter, which means they are more independent by nature. Cats also didn’t develop the complex facial muscles to show a wide variety of expressions like dogs can. 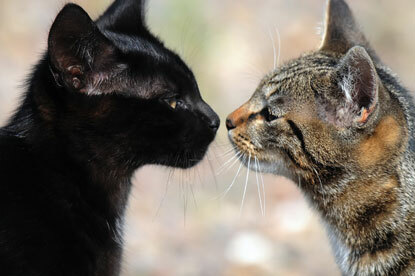 If you want to see if your cats get along, then it’s all about reading the body language! If they walk around each other with an upright tail, rub against each other, or play-fight with their claws tucked in, then those are all signs of feline friends! Forget Superman, Wonder Woman and Black Panther, cats are the only superheroes we need! They may not have super strength, high-tech gadgets or the ability to fly, but they can save the lives of their loving owners, as this bunch of National Cat Awards finalists prove. 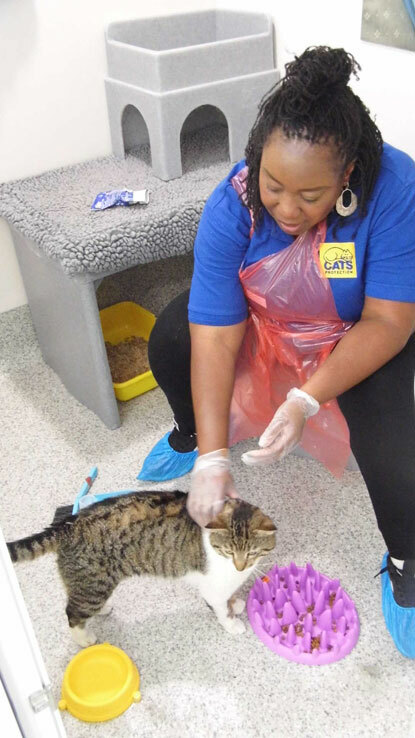 Holby City and Strictly Come Dancing star Chizzy Akudolu recently took time out of her busy schedule to help out at Cats Protection’s Mitcham Homing Centre in South London. Chizzy, who has her own cat called Bootsy, spent the day feeding the cats in the centre’s care and cleaning out their pens as well as tweeting about all the adorable moggys she met. 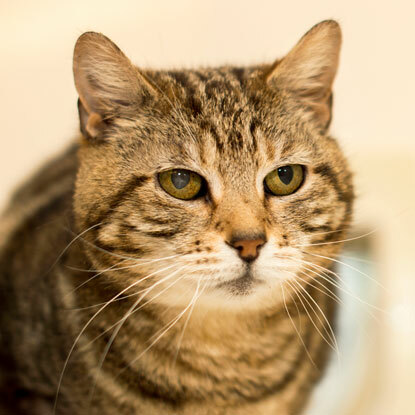 One of the cats she had the pleasure of fussing was five-year-old tabby-and-white cat Rice who is FIV-positive. 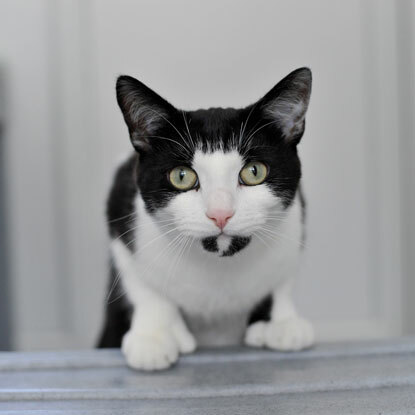 “Rice is absolutely adorable and cuddly, a real sweetie who would make a lovely pet,” says Chizzy. 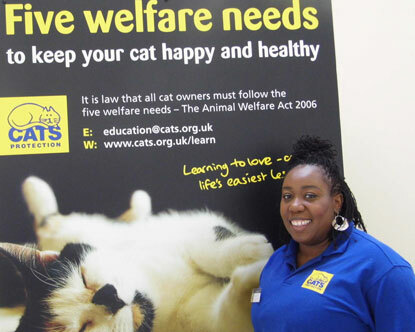 Cats Protection’s Mitcham Homing Centre needs more volunteers like Chizzy to help them care for cats in South London. 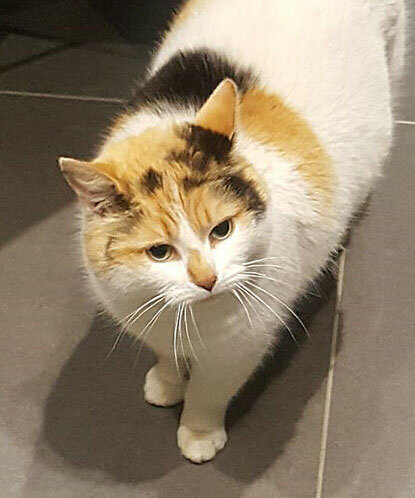 “For every cat we help, there’s another waiting cat to come in, so we need volunteers to care for cats in their own home until a new owner can be found” said Rosie King, the centre’s Deputy Manager. “No special equipment is needed but cat fosterers need to have either a spare room or an area in their garden where a cat pen can be housed, and of course a love of cats is a must. The centre will provide plenty of assistance and support materials for all fosterers. If you’ve ever walked into a room to find your cat staring at you, or witnessed them gazing at you wide-eyed as you eat, then you’ll know it can be a little unnerving. Rather than challenging you to a staring contest, this curious behaviour is actually something you may have trained your moggy to do without even realising it. As a solitary species, cats don’t naturally feel the need to hold eye contact with others to communicate but if they think they can get something out of it, then they might be willing to give it a go. For example, if your cat has stared at you in the past, you may have taken it to mean that they want food or maybe attention and given them a tasty treat or a bit of a fuss in response. Your moggy pal will then have learnt to associate eye contact with an enjoyable reward and will want to try it again to see if they get the same result. The more you reward this behaviour over time, the more likely your moggy is to stare at you to get their way. Cats have learnt to miaow for the same reason, as they have no need to communicate in this way with other cats. When they miaow at us we often interpret it as them saying they want something and then reinforce this behaviour by giving them what they want. As well as being a method of communication, staring is also a sign of a close bond between you and your cat, as they are unlikely to hold eye contact with someone they don’t like or trust. If they slowly blink while looking at you, then that means they love you even more, as they trust you enough to close their eyes in your presence. If you want to show them you love them too, try returning the gesture by slow-blinking back. Although staring is usually nothing to worry about in cats, if your cat has only recently started this behaviour then it’s a good idea to mention it to your vet so they can rule out any medical causes. In older cats, staring could be a sign of sight loss, so get them checked out as soon as possible. For more information about cat behaviour, visit the Cats Protection website. 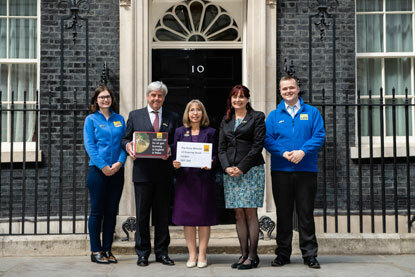 With Cats Protection’s annual celebration of amazing cats just around the corner, it’s time to meet the finalists for the National Cat Awards 2018. We have been announcing the finalists for each of the seven categories over the last few weeks, including Furr-ever Friends and Most Caring Cat. From tales of friendship with felines, to inspiring stories, the National Cat Awards focus on the relationship between cat and owner. 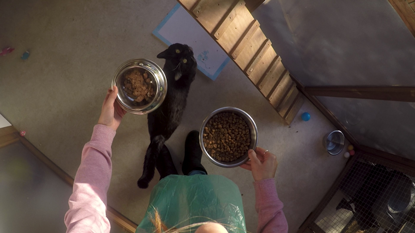 This week, we meet the finalists of the PURINA® Better Together category. Meet the finalists; Theo, Nana and Stubbsy, in our videos below. Seriously ill with cat flu as a tiny kitten, Theo was not expected to survive. With round-the-clock care from Charlotte Dixon, the plucky puss pulled through. Several years later, Theo came to Charlotte’s’ aid, preventing her from falling asleep while a potentially deadly blood clot worked its way through her body. Thankfully, Charlotte went to hospital where she made a full recovery. When Claire Daly heard about a stray handed into a vet with horrific injuries from a car accident, she didn’t hesitate to offer him a home. Nursing him back to health, Stubbsy soon became a much-loved member of the family. And when Claire herself was diagnosed with leukaemia in 2015, Stubbsy was there with non-stop cuddles, entertainment and company. You can vote for your favourite PURINA® Better Together finalist on the website this weekend (Saturday 16 and Sunday 17 June). Go to www.cats.org.uk/nca to vote. Cats can make the purrfect companions for young children, helping them learn about compassion and responsibility while providing a vital source of comfort, particularly during difficult times. For Cats Protection’s 2018 National Cat Awards, we’re celebrating the close bond kids can have with their kitties with our Furr-ever Friends award. 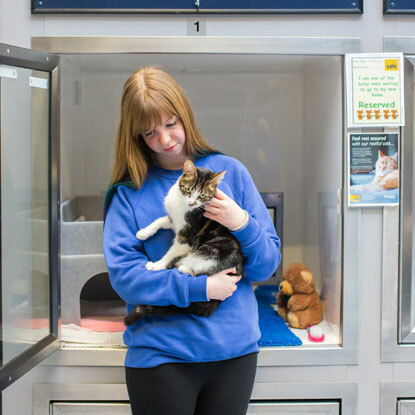 In celebration of the excellent volunteers that help run our branches and centres up and down the country, we’ve been sharing some of the stories of what it’s like to volunteer for Cats Protection. If you’re seeking a role that allows you to help the cats in our care directly, you might like to consider becoming a transport and rehoming volunteer. 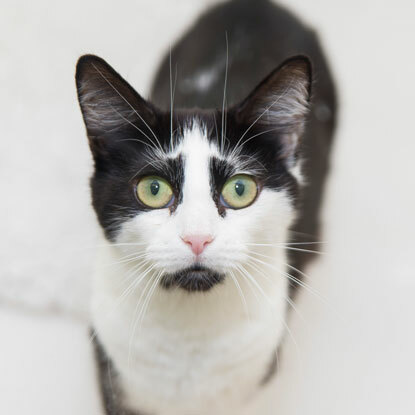 This role is particularly important, as it ensures cats are matched with the right home for them, as well as ensuring that potential owners are matched with the right cat! Part of the job is carefully transporting cats to the vet in order to receive the care they need. Some cats that are brought into our branches and centres require medical care, particularly if they have been found stray or abandoned. 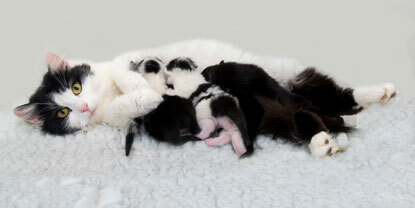 Others may require routine veterinary treatment including neutering and vaccinations. The homing aspect of the role makes it ideal for keen communicators, as you’ll spend a lot of your time talking to potential owners about what they’re looking for in a feline friend. You’ll need to be confident with conversation as well as handling cats, and willing to work with an amazing team. Some of the cats that come into our care can be shy, nervous or aggressive because of their past or if they are struggling to adapt to the rescue environment. Our dedicated team of cat desensitisation volunteers help these wary moggies to become happier and more confident cats by spending time gently handling them and playing with them. This helps to prepare them for finding their perfect forever home where they can continue to develop their pawsome personalities. This is an ideal role if you want to spend time with cats and make a direct contribution to improving their lives. It can also be beneficial for your own wellbeing as volunteering with cats can improve your mental health. As you’ll be working as part of a team, you’ll have the opportunity make lots of new cat-loving friends and learn lots more about felines. How many hours do I need to give? 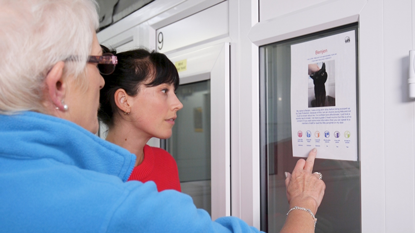 This role is flexible and most cat desensitisation volunteers give one to two hours a week. However, the role can be shared between more than one volunteer if needed. We request that volunteers spend time with a particular cat on a weekly basis, as this will be more beneficial for the cats in care. If you’re considering volunteering for Cats Protection, you might be thinking about a role that allows you to get up close and personal with the fantastic felines in our care. While the cats are waiting for their forever homes, they are cared for in one of the many Cats Protection centres around the country or looked after by one of our volunteer fosterers. Fostering is just one great way you can help cats in your community. As a fosterer, you’ll take cats into your home and temporarily provide them with care until they find a home. Many fosterers house their foster cats in a cat pen in their garden, while others prefer to provide a spare room. Fostering isn’t just great for the cats too – it offers cat-lovers an opportunity to help cats without the ongoing responsibility that comes with owning a pet. As some volunteers can’t commit to owning a cat permanently, fostering gives them a chance to do something practical to help felines in need. Have you stumbled across a cat in your garden or local park and are unsure what to do next? If the cat isn’t too willing to greet you, you might even ask yourself whether you should be approaching it at all. 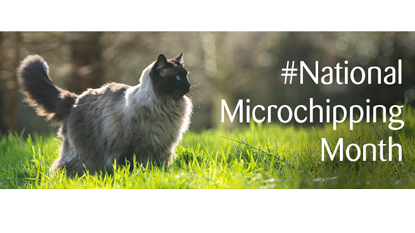 As June is National Microchipping Month, we want to ensure that everyone knows what to do when they find a cat that appears to be lost. Our campaign, Whose Stray is it Anyway? offers advice on what to do if you find a cat, as well as the importance of getting your cat microchipped if you’re an owner. With most cats inclined to wander, it can be tricky to tell if they are a stray cat, feral cat or even an owned cat with a friendly nature and a love for food! If you’ve noticed the same feline hanging around the area or looking disorientated, however, it might be time to do something. To determine whether the cat you’ve found is a stray or feral, use our handy interactive tool. Remember, if you find an injured cat, whether stray or feral, the quickest course of action is to take the cat to a vet or call the RSPCA, SSPCA or USPCA. Caring for abandoned and unwanted cats is a big part of what Cats Protection does, but we wouldn’t be able to help thousands of cats each year without our team of dedicated cat care volunteers. While they’re waiting to find their forever homes, the cats are cared for in our 36 centres or in the homes of our volunteer fosterers. Our cat care volunteers help to look after the cats and meet their needs while they are in our care. It’s a purrfect role for cat lovers, as you’ll get to spend time directly with the cats before they find new owners. It’s also a great way to learn more about cats and make a real difference to their lives as you’ll be helping to prepare them for their new homes. You’ll also be working as part of a team, so you might just make some new cat-loving friends too! This is a flexible role and most cat care volunteers usually give around two to three hours a week. However, the role can be shared between more than one volunteer if needed. 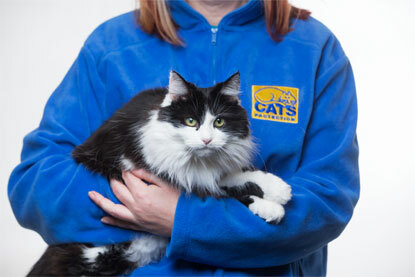 Thinking of becoming a volunteer for Cats Protection? Volunteering with a charity can be rewarding, enjoyable and bring with it a wealth of new experiences. You might be surprised to find, however, that not all of our volunteering roles involve looking after cats. Are you a wannabe fashionista or merchandiser? Perhaps you’re a keen book fan? Volunteering in one of Cats Protection’s retail stores could be a perfect option, giving you the opportunity to showcase your skills while raising money for the cats in our care. Book worm volunteer: do you know your Stephen Kings from your Charles Dickens? Becoming a book worm volunteer involves pricing the books up ready for sale, as well as adding creative flair with shop displays. Delve into some of your fictional favourites – who knows what you might be able to sell? Flair for fashion volunteer: there’s nothing quite like a vintage charity shop find, and volunteering in our retail stores give you the opportunity to hone your fashion skills. Sorting out stock, pricing up items and creating attractive window displays are all part of the fun. Manning the tills: If your passion lies in talking to people, manning the tills might appeal to you. It’s the ideal way to get to know people in your community and even increase your confidence. Plus, you’ll be content in knowing that the money from your sales goes straight to the cats. Stocking the shelves: whether you want to give visual merchandising a go, or prefer being away from the action while still meeting new friends, keeping the shelves stocked is an important part of being a retail volunteer. There’s nothing quite like the pride of devising your own window display! A day in the life of a retail volunteer can be varied and rewarding, offering the chance to meet new people and raise much-needed funds. Follow Greg in our video as he visits Eastbourne charity shop and some of the volunteers that keep the store running.